Do you recommend a specific internet browser to download the ExamSim Player? Although the program download is compatible with all browsers, we recommend using Google Chrome or Mozilla Firefox as your browser, especially if you experience difficulties with IE and/or Safari. Will the Pegasus player work on a MAC? Yes, you will need to use Google Chrome as your internet browser to download the player. I just purchased the ExamSim Program. How do I access it? 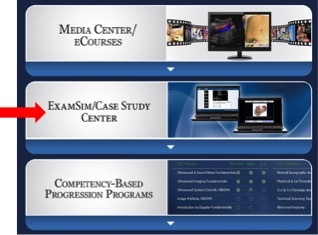 Click on the ExamSim/Case Study Center panel to download the player. I clicked on the ExamSim / Case Study Center panel and I only see ExamSim/Case Study Player Download and the rest is a white screen. Please refresh your page and wait a moment for the download icon to load. When I click on the launch player button nothing happens. Internet Explorer and Safari web browsers sometimes disable Flash which is necessary for the Pegasus Player. You can either try to activate Flash, or you can try another browser such as Google Chrome or Mozilla Firefox. Note: Mac users, check your security panel and allow the program to download. I clicked on launch player and now I am stuck on a screen with an Adobe Air Installer box running and nothing is happening. Please make sure you have clicked on any ‘Allow’/‘Deny’ pop up buttons at the top of your screen. Check to make sure that the pop up box is not hidden behind another window. I previously downloaded the ExamSim player. How do I access it? . A shortcut icon that is labeled “Pegasus ExamSim Player” was placed on your desktop (PC users) or in your launchpad (Mac users). I downloaded the Pegasus Player. What is my login information? If you placed your order online, you created your own password. If you do not recall your password, please click the ”Forgot Password” option to reset your password. If you placed your order through our office, your password will consist of your First and Last name initials in lowercase letters plus 1234. (Example: cd1234) Once you have entered your login information, click the Begin button. It is recommended that you create your own password. To change your password, login to www.PegasusLectures.com, scroll to the bottom of the page, click on My Account, and select ‘Change my account password’. I entered my login information into the ExamSim player login screen and the program could not validate my credentials. The login is case sensitive. Please renter your information. If you receive the error again, please visit our website at www.PegasusLectures.com and click on the “Forgot Password” option to reset your password. If you still need assistance, please call our office at 972-564-3056 or email technicalsupport@PegasusLectures.com. I logged into the program successfully, but there are no ‘Active’ programs in my account. If you originally downloaded and logged into the ExamSim player on another computer you must ’EXPORT‘ your records before being able to run the program on a different computer. The ‘Export’ feature is located on the Main Menu and provides the option to export via internet or USB drive. Once you have used the export feature on the first computer, click on the ’IMPORT’ button to transfer your records to your current computer. If none of the above applies, please email technicalsupport@PegasusLectures.com or contact our office at 972-564-3056 for assistance. I logged into the program successfully and my exam is listed under ’Active’ programs. When I click on the ’Begin’ button nothing happens. Make sure you have clicked on the specific exam you wish to start and then click the Begin button. I cannot advance to the next screen. Your screen size needs to be adjusted in the ‘Display’ setting of your computer. Alternately, PC users can slide your task bar from the bottom of your screen to the right side of your screen. Moving the task bar will allow the program buttons at the bottom of the screen to be visible. Mac users will move the docking station to the left or right side. I am on the Main Menu, but the only button highlighted is CME. Please click on the CME button and read the CME pages. CME providers require that the CME information is read prior to the activity beginning. After you have finished reading the CME pages, the other Exam button will become active. I downloaded the Pegasus player on a computer that I decided not to use. How do I switch computers? If you have only downloaded the player and have not logged in to the actual exam, you can simply download the player again to the desired computer. If you have already accessed an exam and wish to switch to a different computer, you will need to use the ’Export‘ feature to transfer your program to another computer. You will also have to download the Pegasus player to the new target computer, then login and click ’Import’ to complete the transfer. You can download the player again by clicking on the ExamSim/Case Study Center panel in My Pegasus. I started a test, how do I see the answers? In order to see the answers to an exam, you will need to click ‘End Exam’ and then select ‘End Exam and Score’. If you select the ‘Return to Exam Later’ option, the review button will not highlight. I completed an Exam and want to review my results but when I click on Exam, my answers are gone. After you have completed an exam, click on ‘End Exam and Score” to finalize the exam. You will then be able to view the Report Pages which include overall results, score by section, details as to how you changed your responses and the resulting impact on your score, as well as subject areas and question types with which you experienced difficulty. The next report page details your scores in subcategories for each of the subject areas. The final report page provides a history of all the exams you have completed and demonstrates your overall progress and progress per subject category. To review your exam results, go to the ‘Review’ button on the Main Menu to access the Review section. In the Review, you will see your answer, the correct answer, and thorough explanations. Note: After you have finished an exam, if you click on the “Exam’ button again before you access the Review section for your completed exam, a new exam will start and your previous answers will be erased. The program opens a window that is 1024 x 768. If your maximum screen size is less than the program size in either dimension, part of the program will be cut off. To resize your computer screen you will need to open the Control Panel and find Display Settings. The Control Panel is usually accessible from the Windows Start menu. If a height of 768 is the maximum screen setting possible, you might want to move your windows taskbar to a side of the screen so that the bottom of the program will not be hidden. It is possible to stop an exam and return at a later time. This is achieved by clicking “End Exam” before the end of the allotted testing time expires and then choosing “Return Later.” Upon return, the exam will bring you back to the question last question you were reviewing. The exam will be marked as “currently in progress” on the exam menu page. Although it is possible to quit and return later, it is highly suggested that you take the exams in one sitting to better simulate an actual exam, and for better feedback from the analysis tool. Each exam can be taken actively 8 times for a score. An exam attempt is considered completed when either the allotted testing time expires or you choose “End Exam” and then “End Exam and Score” when prompted. Exam score reports become active only once an exam attempt has been completed. You will not be able to see an exam score report if an exam attempt is currently in progress. At the completion of an exam, you will be taken directly to the exam score report. You can view the exam score reports for a completed exam at any time by choosing Reports from the main menu page. The exam score reports can be printed. If you take an exam more than once, the exam score report shows your results from the last exam attempt. Once an exam is completed (either the allotted time for the exam expires or you have selected “End Exam and Score”) the Review button for that exam becomes active. In review mode, you can see the exam questions, which choice you selected, the correct answer, and detailed explanations. The review mode remains active even if you have used up all of your active exam attempts for a score. 2. Go to the Main menu of the program you want to export and select "Export Program"
6. On the "Selection" menu select "Import Program"
8. Select the program from the list and click "Begin"
CME submittal is only allowed once you have achieved a passing score on an exam. You can submit for partial or full credit. The CME submittal process takes place online. Selecting the "CME" option from the Main menu will open a browser window where you will find instructions on completing the process.